Prosciutto is a member of La Squadra di Esecuzione. 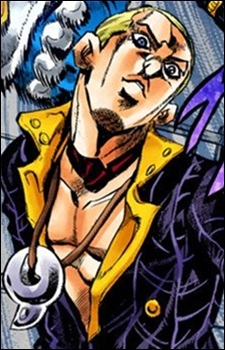 He is partnered with Pesci, who refers to Prosciutto as his "big brother" (or aniki), a title typically used by yakuza when addressing their superior. They try to assassinate Buccellati and his friends on a train headed to Florence. His Stand is The Grateful Dead (ザ・グレイトフル・デッド（偉大なる死） Za Gureitofuru Deddo). A massive humanoid torso with no lower body. Instead, it trails wires from its "waist", and its entire surface is covered with evil-looking eyes. The eyes exude a vapor that rapidly accelerates living beings' aging. However, the aging is staved off by cold, meaning that women (who have a somewhat lower body temperature on average than men) age less rapidly, and, as Bucciarati discovers, one can completely avoid the effect by holding ice up to the affected areas. The aging process accelerates even further if The Grateful Dead actually makes physical contact with a victim. Prosciutto can choose whether he is affected; if so, his touch has the same effect as The Grateful Dead, and will reverse his own aging.